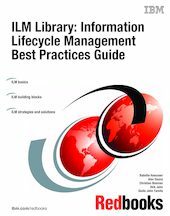 This IBM Redbooks publication focuses on business requirements for information retention. We provide practical recommendations for implementing a robust information management strategy. We also investigate the interactions of the various products and make recommendations for their use in different retention scenarios. This book presents both a strategic and a practical approach. The strategy focuses on the value of ILM within an overall information management framework. The practical sections cover best practices for implementing and integrating ILM as a business process for long-term information retention.